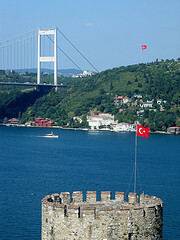 On this date in 1463, the last regal claimants of Byzantium’s last successor state were executed in Constantinople. Specifically, he cleverly set about needling the overwhelming Turkish power on his borders by vainly attempting to stir up another Crusade, and refused to pay the Mohammedan tribute. Having recently reduced the impregnable fastness of Constantinople, Mehmed the Conqueror handily availed this provocation to overrun Trebizond. David and kin made out okay by this calamitous extinction of the Byzantine candle, negotiating in the summer of 1461 an arrangement to settle in Adrianople under the sultan’s protection (and monitoring). Two years later, David was reportedly caught plotting against the keeper of his gilded cage once more, and Mehmed had the former Emperor, his sons, a nephew and a brother-in-law beheaded, neatly extinguishing the last people with any lineal claim the late Greek imperium. Theodore Spandounes, a Venetian of Byzantine refugee stock writing in the early 16th century,* claims this was a set-up by Mehmet, “ravenously thirsting for Christian blood,” and that the Komnenoi were given the chance to convert to Islam and atoned their poor statecraft with holy martyrdom. Mehmed confiscated all the property of the imperial family of Trebizond and condemned the Empress [Helen Kantakouzene or Cantacuzene] to pay 15,000 ducats within three days or be executed. Her servants, who were Mehmed’s prisoners in Constantinople, worked from dawn to dusk to raise the money and paid it … [but] she had no desire to remain in this world; and, clad in sackcloth, she who had been accustomed to regal finery, refused to eat meat any more and built herself a hovel covered in straw in which she slept rough. Mehmed had decreed that no one was to bury the bodies under pain of death. They were to be left for the dogs and ravens to devour. But the sainted Empress secretly acquired a spade and with her own delicate hands as best she could dug a trench in her hut. All day long she defended the corpses against the animals and at night she took them one by one and gave them burial. Thus did God give her the grace to bury her husband and her sons; and a few days later she too died. * And writing, it should be observed, with the polemical intent of persuading western powers to go fight the Ottomans.